Take your fitness game to the next level and achieve a more muscular and toned physique with the Marcy Standard Weight Bench! This complete gym system lets you train without having to leave the comforts of your home or pay club membership fees! 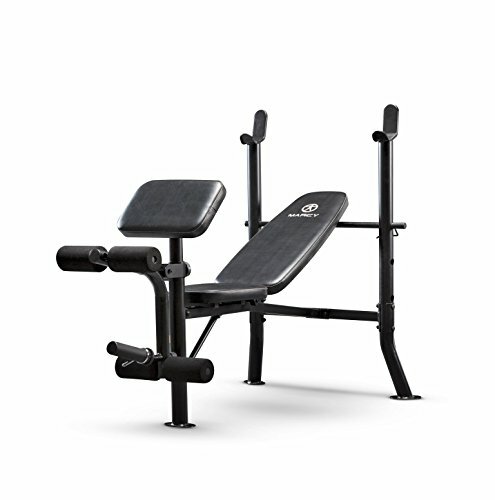 This bench press rack is made of a heavy-duty steel tube frame and high-density vinyl foam. The powder-coated finished steelwork effectively resists damage from intense use, guaranteeing you an investment that is built to last! It’s off-the-floor base frame provides increased stability when you perform exercises and incorporates the functionality of various machines into one compact design, saving space in your home gym. For dedicated bicep workouts using dumbbells or weights, the free-weight rack allows you to store standard weight bars and weight plates and efficiently perform strength training without having to switch to different workout stations. You won’t have any excuse for missing out on leg day or adding muscle to your lower body, as this equipment also showcases a leg station. Work out your hamstrings, quadriceps, and glutes with the leg developer that includes a pivot point that aligns knee joints in the proper position, helping you avoid incorrect body form that can lead to injury. It also ensures adequate muscle isolation so that you can effectively target the development of specific muscle groups. Train like never before and rack up a healthier and fitter body with the Marcy Standard Workout Weight Bench! HEAVY-DUTY CONSTRUCTION - The MWB-382 is made of 14-gauge tubular steel that's reinforced with a powdered coating; guaranteed to withstand intense use. It utilizes high-density foam for cushioning, providing you with comfortable and high-functioning gear. FREE-WEIGHT RACK - Engage in intense weightlifting or strength-training right in the comforts of your home with the Marcy Weight Bench! It includes a weight rack that fits standard-sized barbells and weight plates for easy accessibility and convenience! FULL-BODY WORKOUT STATION -This complete exercise equipment features an innovative structure that combines arm and leg stations, great for strengthening various muscle groups and executing complete workouts.